Operating under permit from Local, State and Federal governing agencies, commercial outfitters provide American River rafting trips as well as access to other geographically remote and technically challenging rivers throughout California. One of the California's original outfitters, All-Outdoors California Whitewater Rafting has offered professionally guided whitewater adventures on 12 of California's most scenic and exciting rivers for the past 40 years. 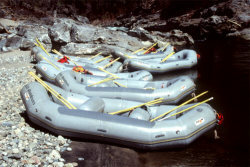 All-Outdoors offers American River rafting trips on all three forks of the American. The American-Rivers.com website was created in part by the All-Outdoors web development team, as a resource of information about American River rafting for the general public. The official All-Outdoors website has recently been recognized as "The Best Small-Business Site in America" in Inc magazine's 3rd Annual Web Awards.